Years before I started incorporating greens into my diet regularly I would never think of eating wilted, cooked down piles of leaves. The closest thing I got to cooked greens was cream of spinach, which hardly counts considering it is simmered in heavy cream and a good dose of butter. As a healthy foodie I’ve learned to embrace greens not only for their health benefits (energy boosters, inflammation reducers, tons of vitamins and minerals) but I also fell in love with the versatility of cooking them. Especially beet greens. For a long time I would toss beet greens in the composter for the worms to eat until my mother in law gasped in horror one day. Beets are one of her favorite foods but she told me the greens are even better. I was skeptical to say the least but she is a great cook and I trusted her. 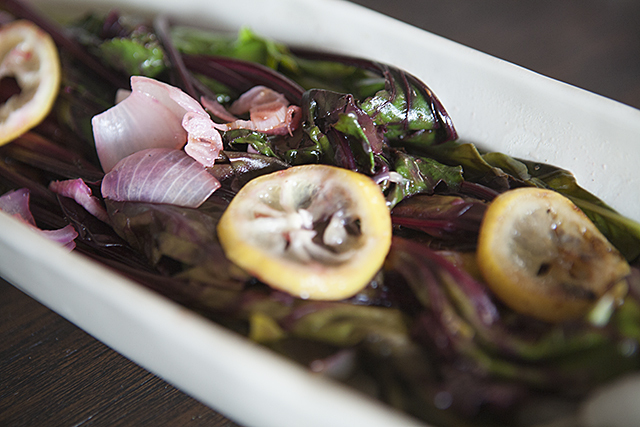 She steamed the greens with a little lemon and then doused them with red wine vinegar and salt and pepper. I couldn’t stop eating them. They were bright, tangy and delicious. I was a changed woman. 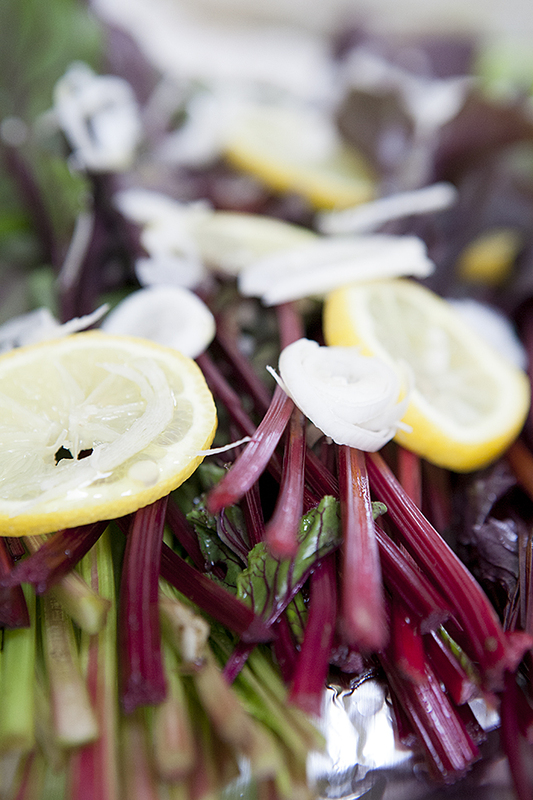 With summer in full force and beet season pumping out beets like nobody’s business I’ve taken my greens outside to my beloved grill so she can impart the kind of flavor that being outside on a long, warm day can do. The trick to cooking greens on the grill is to package them up neatly into a foil bed. As a child my mom used to call these hobo packs – place all your ingredients in a little foil pocket and cook on an open flame. We would make a variety of these hobo packs to take on our summer camping trips to make dinner easy. Now that you have your greens in the foil, add a few slices of lemon or orange, a few mashed up pieces of garlic, a splash of vinegar, salt, pepper and then seal those babies up. Make sure your grill is nice and hot but leave one of the burners off so you can cook the greens without the risk of burning their pretty little leaves. After about 8 – 10 minutes on the grill you’ll have greens that are tender, flavorful and a great crowd pleaser. Give them a good glug of good quality olive oil and you’ll find yourself in a green paradise. Turn your grill on to medium heat, making sure to leave one burner off. Rinse the greens and but off the bottom 2-3 inches of stems. Create your foil packet and place the greens, lemon or orange slices, garlic, salt and pepper and vinegar on the foil and seal it up. It doesn’t need to be super tight though – you’ll want enough room for some steam to circulate in the packet. After 8 minutes open up the foil packets (watch for steam!). If the greens are tender and bright green they are done! Finish with the olive oil and enjoy! my new exciting life + a salad that will rock your world! i am a health coach. YAY!